You can now sends friends money over Facebook Messenger. Twitter makes it easier to report harassment on the social network. These stories, and more, in today's Morning Social Media Newsfeed. While your friend might love Pusheen stickers, Facebook’s latest update to its Messenger app allows friends to send something just as precious: money. 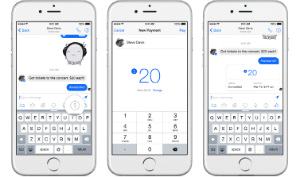 Facebook announced Tuesday that friends can now send money to each other using the app. The Next Web The app now features a small “$” sign above the the keyboard, which will lead you to a payments interface. Just enter the amount you want to send, and tap pay to send money. Re/code The money is then transferred through Facebook, which holds the money for “seconds” before sending it along to the other user’s bank, according to Facebook product manager Steve Davis. If the recipient doesn’t have a card attached to his or her account, Facebook will hold the money until they’ve set one up. Mashable Facebook users can only add their debit card information for now, a decision the company said was made to minimize fraud and avoid fees. (Popular peer-to-peer payments app Venmo lets users add credit cards but charges a 3 percent fee on each transaction.) The New York Times Given Facebook’s huge size and reach, the introduction of its payments feature — which has been highly anticipated by Wall Street — is likely to cause tremors in the nascent market for instantly sending money to individuals, known as peer-to-peer payments. WeChat, which is essentially the Facebook of China, and other Asia-based communications services like Alipay already allow their hundreds of millions of users to send money via instant message. Twitter is rolling out a new feature that enables users to compile harassment reports to document threatening tweets. This release follows recent efforts from Twitter to crack down on harassment and bullying, including the company’s move to ban “intimate photos or videos” shared without consent. Netflix is steadily building up a real library of original content that goes far beyond “House of Cards.” And that’s not just because season three of “House of Cards” was a major disappointment. The subscription-driven music service Rhapsody will allow its subscribers to share full songs on Twitter starting Tuesday, making it the first paid streaming music service to offer whole-track playback directly from a tweet. Followers on Twitter can listen to the song, regardless of whether they subscribe. Following the massive success of “Kim Kardashian: Hollywood” on mobile and Facebook (pictured), Glu Mobile has announced its partnership with Kendall and Kylie Jenner for the development of a new mobile title. Kendall and Kylie’s likenesses were previously featured in “Kim Kardashian: Hollywood,” with this game expanding on the lives of the fashion personalities. Before IBM officially opened its new tweet analysis tool for business on Tuesday, it was testing the tool out with 100 companies. And in just a few short months of doing that, IBM learned some surprising discoveries, it said. Just as quickly as the next hot app — say, Meerkat — can rise (and fall), social marketing trends can also shift. Adobe chief marketing officer Ann Lewnes — fresh off an interview with “Birdman” actor Michael Keaton — spoke with SocialTimes at the recent Adobe Summit about how to stay ahead in social marketing, the Apple Watch and the importance of data analysis.